Explore Naxos Island by renting a suitable vehicle! 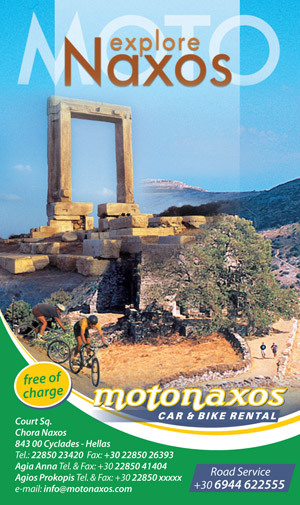 Experience Naxos Island with a reliable and safe rental car, bike or quad from motonaxos. If you truly want to experience Naxos Island, you must be able to get around easily. The most efficient and comfortable way to visit the island is to rent a car. Rent a Car in Naxos by Motonaxos and we will assist you by providing you the rental car that suits your specific needs. If you are an adventurous person you could rent a quad 4x4 or an off-road motorcycle so as to explore the beauties of Naxos Island. Below we have mentioned a few suggested driving routes for Naxos sightseeing and touring, as well as many beautiful places to visit in Naxos. Also we’ll help you to find the right rental vehicle for your needs. Get ready for exciting road trips on Naxos island, safety and comfort, to gain unique driving experiences! Visit traditional villages on Naxos Island! 1. HALKI is one of the most beautiful main villages in Naxos, located 17km from Naxos town. The easy access and the main asphalt road give you the opportunity to hire a car, a buggy or ATV reach there. Pay attention as it is prohibited to park on the main street that crosses the village. The beautiful houses of Halki village provide evidence for the village’s earlier prosperity: this is a small lordly township which has its own important market. Apart from the historical monuments-church of Panagia Protothroni, Grasia tower-it is also worth visiting this area for the traditional citron distillery in Halki and the restored, oil press in Damalas. Around Halki stand the villages of Tragea: Kaloxilos, Damarionas, Kerami and Damalas. 2. APERANTHOS the most elegant from the all villages on Naxos island! The road is uphill with hairpin bends, with many worth view points. Renting a car, a medium-large size atv, big buggy or even a motorcycle you will be there in approximately 40 minutes. Outside of Aperanthos village the parking place is really helpful. The village has narrow marble paved mule tracks, often covered by archways. Zevgoli Tower, built on top of a rock at the entrance of the village, is very impressive. The three museums in Aperanthos are well worth visiting and so is the exhibition area of the Women Handicraft Center. 3. KORONOS is the next stop, a beautiful village built in a valley at a height of 540 m. Whichever is your preferable rental vehicle, it has to be over the medium size to get there. If you have rent a car, park it outside the village and follow the steps till the center of the village. Koronos preserves its traditional island color, its mansions and simple houses and its long, uphill mule paths. Right before the village, there is a winding road which, after a downhill drive, leads to the beach of Lionas village with its large round white pebbles. 4. APOLLONAS is a fishing village on the north-eastern coast of Naxos, with sandy, pebbled beach, in an area where ancient marble quarries have been found. Car rental, a full size motorbike rental,big size ATV is the best way for this trip. Near the village, at the entrance to an ancient quarry, there is an unfinished statue –Kouros- lying on the ground. Visit the most beautiful beaches in Naxos! 1. Agios Prokopios beach is a famous tourist resort 6km from the Naxos port. The sea is crystal clear and the beach is sandy. It is possible to rent scooter, moppet or even a bicycle to get there. You will find big parking place near the beach but pay attention to the salt pit. 2. Agia Anna, adjacent to Agios Prokopios, with a large parking area. The quickest way to get there in the high season is to rent a scooter or an atv. From Agia Anna there is a passable country road which leads to the huge beach of Plaka, a beautiful and relaxing beach, with facilities for water sports. Rent a 4x4 jeep or 4x4 sport model of quad and enjoy the crossing of sandy road. 3. Mikri Vigla beach is a beautiful with lots of windsurfers. This area, due to the ideal weather conditions, has been chosen as a meeting place for windsurfing fans from all over the world. If you are a surfer prefer to rent an open top jeep or you can hire a car with rack to transfer all your equipment. The next beaches are the exotic beaches of Kastraki and Alyko, with sand dunes and cedar trees. By renting an atv, buggy or scooter you can reach all the south beaches. Pay attention as driving on the beach and in the dry lakes is forbidden. 4. Moutsouna-Psili ammos-Panormos On the eastern side of the island is Moutsouna, a seaside settlement, with the beautiful beach Psili Ammos. The port of Moutsouna was one of the first industrial developments on the east side. The road ends up to the wonderful beach of Panormos. The easiest way to explore this side is by hiring a car over to medium size or an open 4x4 jeep. Attention, the road is steep narrow an full of hairpin bends. 5. Amitis –Abram From Hora, we go to Apollonas village by the coastal road travelling along the north-western shores of the island. Along the way, we pass by the villages of Engares and Galini. In this area, there is the beautiful Amitis bay, a large white and sandy beach. Directing to Apollonas, you will find the next beautiful beach, Abram bay, with clean sand and warm water. There is a small settlement here and a tavern. For this tour it is highly recommended to have a car rental, a medium-large size atv or to rent a motorbike.